Beautiful coastal chart of the harbor on Pass Christian, Mississippi, before it was destroyed by Hurricane Katrina. Sketch H No. 9 Harbor of Pass Christian Mississippi Sound. 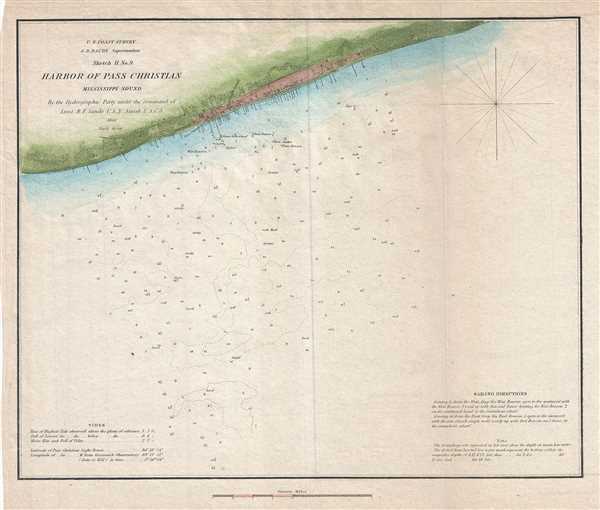 This is a beautiful 1851 U.S. Coast Survey map or chart of the harbor of Pass Christian on the Mississippi Sound, Mississippi. It covers the southern coastline of Pass Christian, a city is Harrison County, Mississippi. The chart features beautiful inland detail including several piers and slips, which would eventually be destroyed by Hurricane Katrina in 2005. Important buildings along the harbor are also identified. Throughout, the map notes numerous depth soundings and other coastal features. Includes information on tides and sailing directions and other features important to the mariner. Hydrography for this chart was conducted by a party under the command of Lieut. B. F. Sands. The whole was compiled under the direction of A. D. Bache, Superintendent of the Survey of the Coast of the United States and one of the most influential American cartographers of the 19th century.